There are so many fantastic burger places in Denver that it makes you wonder whether they eat anything else. The wealth of good burger bars has created some friendly competition that has, to everyone’s delight, raised the bar in quality, as the famous Denver Burger Battle can attest. The burger bars range from counter-serve places such as Larkburger, who pride themselves on the simplicity of their burgers and on returning to their roots, to incredibly innovative places where world-class chefs try their hand at reinventing burgers, such as Park Burger. A traditional, cozy, and relaxed bar and grill, TAG, named for the chef/owner’s dog, is a popular neighborhood watering hole and eatery with 20 beers on tap and burgers that are an art form. You can choose beef or six other kinds of meat, bun or no bun, and then decide between the simple, old-school burger with American cheese, lettuce, tomato, grilled onions, and TAG special sauce, or go for one of the house monsters, such as the Andrew Jackson, which comes with sliced prime rib, fried avocado, pepper jack, grilled onion, applewood-smoked bacon, fried egg, and mushrooms. It is served with porcini parmesan-dusted french fries. Whichever burger you choose, it will be an experience. Also try their duck fat fries and naughty adult shakes. Just when you think that the American craze for burgers could not get any more out of hand, you come across Crave Real Burgers. This LoDo outpost of a popular Castle Rock–based burger chain single-handedly reinvented burgers. In this modern, bright diner you can watch your patty being put together by certified burger gurus. Beef is just the beginning. There is also lamb, pork, poblanos, shiitake mushrooms, cremini mushrooms, thyme, garlic, rosemary, and fried eggs. Even peanut butter is involved; and that is just on the inside. Buns can actually be donuts or grilled cheese or occasionally even real burger buns. But the real craze starts when the gurus start putting your burger together. Just to get the idea, their famous Drunken Mushroom Burger, with Colorado beef mixed with thyme, garlic, and rosemary, gets topped with shiitake and cremini mushroom tempura, cheeses, drunken onions, and truffle mayonnaise. That is one of many inventive, or possibly crazy, burgers on offer at this fun place. 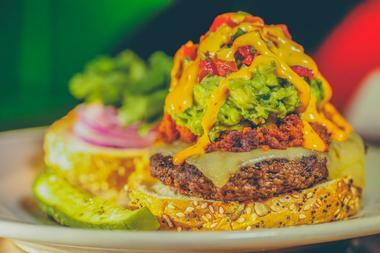 That particular masterpiece was ranked 11th out of 347 burger competitors nationwide. Located in a former barber shop in Denver’s Five Points neighborhood, Dunbar Kitchen is a funky, comfortable watering hole with a fabulous lineup of craft draft beers, excellent cocktails, and a decent wine list. 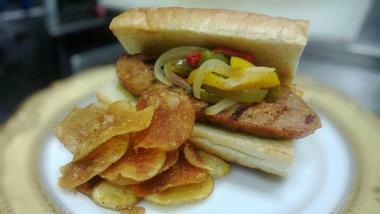 The food is a mix of classic pub grub with several popular Southern classics such as shrimp po’boy. But their burgers are in class of their own. With wall-to-wall flat-screen TVs, a serious lineup of local microbrews on tap, pub grub raised to a gourmet level, and a fun patio for those rare warm days, Highland Tap and Burger is extremely popular and can get very lively and rowdy on a game night. Everything on the menu is outstanding: common chicken wings are not common at all, they are first smoked in whiskey barrel chips and come with the pub’s signature sauce and house-made blue cheese dressing. The mac & cheese is made with three kinds of cheese and the fries are fried in duck fat. But the best surprise is their burgers. They start with a 1/3 pound of all-natural, hand-picked local Angus beef. 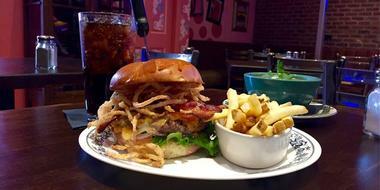 Their top seller is the Tap Burger with Eli's root beer-pulled pork, American and cheddar cheeses, "Mamas Pilsner" onion rings, and their signature sauce. Or you can get the burger that won the Denver Burger Battle – a beef patty with sautéed mushrooms, Emmental cheese, white truffle aioli, and optional shaved foie gras. This is a burger for kings. 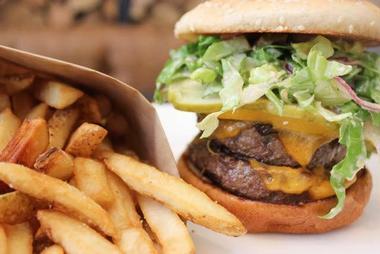 Larkburger loudly proves that a chain counter-serve burger joint can produce perfect burgers. Their Boulder downtown location is also sleek, pleasant, and cozy with a lot of wood and modern furniture, so people can actually sit down and enjoy their clean, classic burger. You can call them “gourmet,” but they are more original than that. No goopy sauces, no 5 inches of wilted ingredients, just honest Black Angus beef and daily fresh-cut tomato, lettuce, onion, pickle, and special house sauce. It also comes with truffle oil aioli if you wish. There are also chicken burgers with adobo grilled chicken breast and roasted portobello mushrooms as well as a grilled ahi tuna burger or a freshly seasoned turkey burger. Get some of their fabulous truffle fries and, if you can, come on Monday with kids when they eat for free. Located in the lobby and the main floor of the popular Hotel Teatro, Nickel is a nicely decorated, comfortable, and spacious American bistro-style restaurant with a mix of rustic touches, interesting local textiles, and a gleaming open kitchen where Chef Chris Thompson prepares locally sourced meals with a strong focus on Colorado flavors – even the rotisserie wood is cut nearby. Dishes are surprisingly simple, allowing the ingredients to burst with flavors, the presentation is fantastic, and the desserts are inventive. 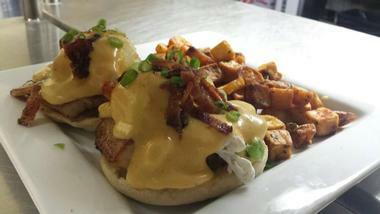 Nickel is a popular brunch place with a large menu that includes bottomless mimosas and White Russians. Charcuterie is the main focus, and their Nickel Brunch Burger consists of a double beef patty soaked in sausage gravy, topped with egg yolk and Gouda cheese, and served with shoestring potatoes. Old Major, a spacious rustic-chic carnivore’s delight with exposed brick walls and chunky furniture made from recycled wood planks, is located in a former roller rink in the LoHi neighborhood. The open kitchen allows for a glimpse of the virtual charcuterie factory going on in the back. To say that the restaurant specializes in pork is an understatement – they butcher it and even smoke it in house. While they prepare pork to perfection, they also offer seafood, oysters, and very good chicken. Chefs Justin Brunson and Steve Allee are proud of their connection with local farmers and fishermen, making Old Major a true farm-to-table restaurant. At lunchtime, Old Major becomes the more casual Royal Rooster, with a small menu of great sandwiches and salads. Their burger is made of two beef patties, American cheese, pickles, grilled onion, and the house special sauce. Try it with their fantastic fries, cooked in duck fat. Ophelia’s Electric Soapbox is an enormous, multilevel restaurant, bar, dance hall, and live music venue in the Ballpark neighborhood. The décor is “boudoir-style” as a tribute to the building’s past – it occupies the ground floor of a former bordello, peep-show parlor, and flophouse, providing the Ophelia with the nickname “gastrobordello.” Colors are over the top and lively, much décor is adult-themed, but the atmosphere is hopping, the live music bands are excellent, and the food is right there with the entertainment. They modestly describe it as “flatbread pizzas, small plates, and burgers,” but everything they serve is innovative, bursting with flavors, and quirky. Their Spanish Bacon Burger is served on an house-baked milk bun and loaded with olive tapenade, sunny side egg, arugula, and romesco aioli. 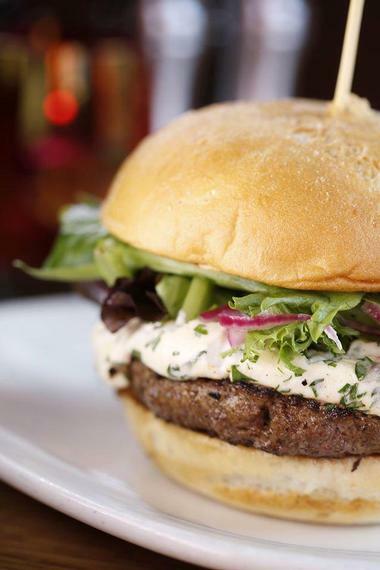 You can also find a Colorado yak burger, Scandinavian duck meatballs, and Belgian mussels. Located in the Source in Denver’s River North Art District in a reclaimed and fabulously renovated 1880s foundry, Acorn is a fun, sleek place with rough brick walls mostly covered with graffiti, soaring ceilings with exposed pipes, and fabulous American family favorites produced by chef/owner Steven Redzikowski using his own twist. The menu mostly consists of small yet interesting shareable plates such as eggplant parmesan sandwich, kale and apple salad, and a divine oak-grilled double cheeseburger that will clog your arteries but fill your heart. 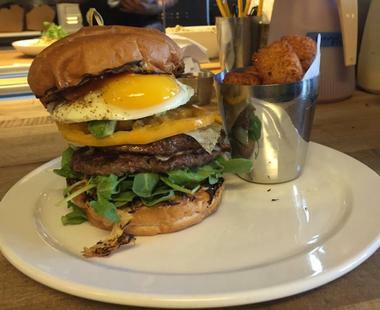 The burger comes with harissa aioli, arugula, Gruyere cheese, tater tots, an optional fried egg, avocado, fried pickles, and bacon. Cocktails are ingredient-driven and there is a nice, well-selected choice of wines and beers. When you put a superb chef like Clint Wangsnes into an unassuming, counter-serve place in Park Hill, don’t be surprised when you get far more than “fast food.” While chef-driven, the restaurant is a popular neighborhood family spot, serving super-fresh and super-fast food that is creative and has a healthy twist – the pastrami is actually smoked chicken pastrami and the salads are both imaginative and filling. Dishes are served on chunky butcher blocks, but your heart will go for their short ribs cooked for 48 hours, shaved slow-roasted sirloin with French dip, and the Chop Shop Burger made of house-ground meat and served with spicy aioli, American cheese, house pickles, tomatoes, and butter lettuce. A few beers and wines are offered by the restaurant’s small bar. Located in an 1883 brick building in Five Points, one of Denver's most culturally diverse historic neighborhoods, Meadowlark is a rustic, unpretentious bar and restaurant that surprises at every turn. The décor ranges from original wall art to antique pieces, such as the airplane manifold lights above the bar and the tongue-and-groove tables made from 100-year-old wood from a Kansas barn. The food is also a pleasant surprise. The small menu is bursting with flavors and everything is carefully chosen. 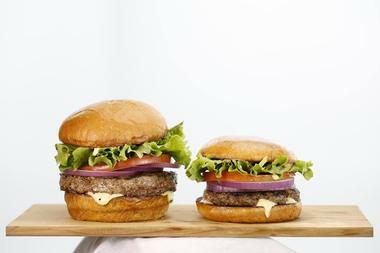 Their spectacularly good burgers are made from grass-fed beef, delivered by local butcher Western Daughters, and is a fine blend of chuck, heart, and neck. 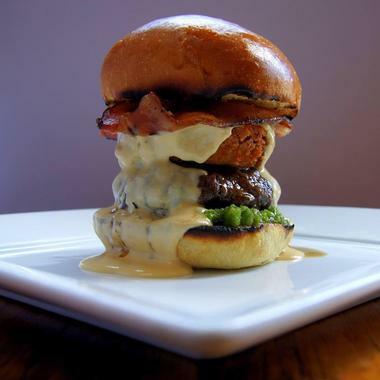 They bake their fantastic brioche buns daily in house and load their burgers with cheddar cheese sauce, an onion ring, candied bacon, and a poached egg. Eight wines, by bottle or glass, eight craft beers, and eight batched cocktails will give you enough to choose to go with your burgers. The Royal is a fun burger bar in the Berkeley neighborhood that caters to local families and aims to serve as a hangout, eatery, and place to socialize. The funky décor with a royal theme combines industrial elements like raw brick with royal blue banquettes, crystal chandeliers, and a large communal table. Walls are covered with photos of celebrities that fit the royal theme, such as Queen Latifah and the Fresh Prince. The menu caters to whole families and offers American comfort food heavy on burgers, fries, and floats, but on a totally different level. You can make your own burger with the large choice of patties (beef, turkey, veggies, or lamb), buns, toppings, cheeses, and sauces, or you can opt for one of their imaginative combinations such as The King of the Forest with beef, fig jam, lettuce, roasted mushrooms, tomato, herbed goat cheese, and a balsamic thyme reduction. They offer a nice choice of local beers and fun floats, both adult and for the kids. Try the Cherry Bomb with vodka, cherry soda, and vanilla ice cream. The Squeaky Bean is a spacious place in lower downtown Denver, beautifully lit with floor-to-ceiling windows, raw brick walls and pillars, ceiling beams, a huge bar, and an open kitchen that dominates the décor. The menu is eclectic and farm-driven – most of the produce comes from their own Bean Acres Farm. Dishes are imaginative and flavorful – try their shared plate with Australian prawns, pork belly, and creamy grits in a garlic tomato broth. 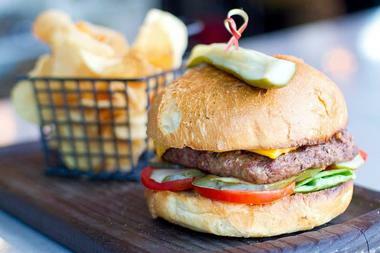 Their bar menu is rich and includes a cheeseburger served with pickles, melted onion, and their special sauce. Bingo brunch on Saturdays and Sundays is a riot. Located in Denver’s LoHi neighborhood behind the bookstore façade, Williams & Graham is a trendy bar in the classic and beloved tradition of old speakeasies – with a hidden entrance behind the sliding bookshelf and a dark and cozy décor with an old tin ceiling and dark woods with gold trim. The drinks are famous – the bar has been voted one of America’s best 50. The menu is small but inspired, with plates such as roasted bone marrow on toasted ciabatta with bacon jam and the Williams & Graham Burger with beef from famous local butcher Western Daughters, prepared with Port Salut and served on a soft bun with caramelized onions and fries on the side. A cozy, comfortable place in the Denver Pavilions mall, 5280 Burger Bar has wonderful loungy vibe with inviting, colorful armchairs and high padded chairs around the busy bar. 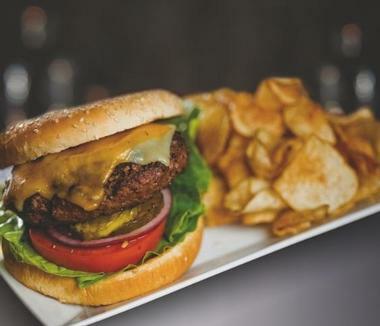 They are known for serving fantastic, chef-crafted burgers, fresh salads, appetizers, and 12 local craft beers on tap. 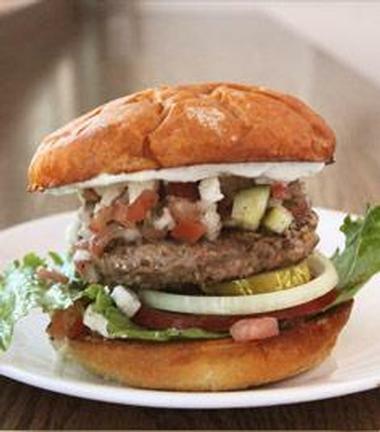 Burgers are made from ground beef, chicken, quinoa, or bison and dressed with interesting combinations of ingredients. Check their Boss Hog with Angus beef, lamb or bison, cheddar cheese, pecan-smoked bacon, slow-roasted pulled pork, and their own BBQ Sauce. Their attached ice cream shop offers home-made ice cream and interesting Shaketini – signature adult shakes. There is a nice outdoor patio when the weather cooperates. 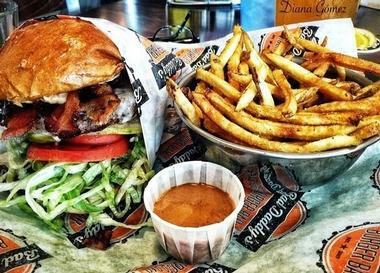 The Bad Daddy’s Burger Bar chain is cropping up all over Colorado and the surrounding states and has a reputation for fantastic, creative burgers, a fun atmosphere, huge portions, and outstanding cocktails. Their downtown Denver location is modern, sleek, and buzzing with activity, with a mix of locals, busy business people grabbing a quick lunch, or the after-work crowd coming to unwind, have a drink, and grab a burger. 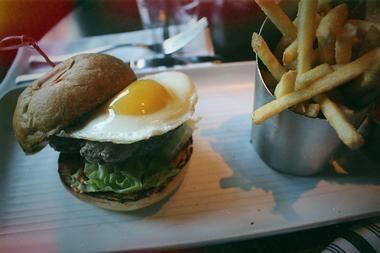 The burgers are enormous, with high-quality meat and imaginative toppings. 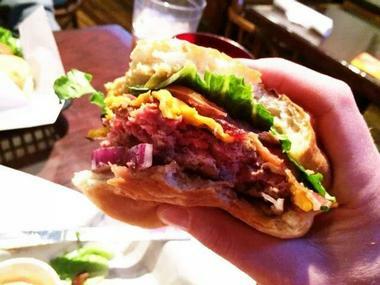 Just as an example, try their Cheeseburger on Steroids with Monterey Jack cheese, three pieces of applewood-smoked bacon, three pieces of jalapeño bacon, house-made bacon mayo, iceberg lettuce, tomato, pickles, and red onion. They serve a huge number of local craft beers, at least four rotating beers on tap, a small selection of wines and excellent, generous cocktails. Candlelight Tavern is an old-fashioned neighborhood dive where locals and the occasional passing visitor come regularly to watch games, discuss world problems with other bar patrons, taste the latest beer on tap, or grab a juicy, greasy burger that clogs the arteries but cheers the heart. The Tavern has been a regular feature in the South Pearl neighborhood so long that it has served several generations of locals. You can see students, regular working folk, sports fans, and whole families out for dinner. Many love playing darts, pool, or foosball or listening to the jukebox. There is a drink special every day and the place gets really hopping on weekends. The menu is limited to regular pub grub, but the burgers are large and juicy. Try their jalapeño cream cheese burger, it has a nice bite to it. Every neighborhood should have a tavern like city grille: Cozy, unpretentious, comfortable, familiar, and with a fantastic menu with so many choices that you cannot possible try everything. Located just across the State Capitol, city grille attracts its share of working bees out for lunch or stopping by for a cold draft beer or for one of the burgers constantly voted the best in Denver. The list of burgers is so large and so imaginative it is hard to choose just one, but to get an idea of what they are all about, try The Lobbyist – a steakburger with cranberry-chipotle sauce, brie, and bacon. 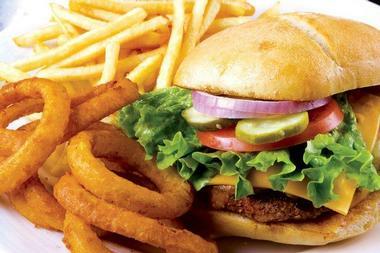 Burgers come with beef, fish, bison, elk, buffalo, turkey, steak, salmon, or veggies. Combine it with their famous green chili for a full experience. There is a small patio with a small bar in the back for those nice days. Citypub and Burger is one of those disappearing classic neighborhood places where families would go for a Sunday lunch, men would go to watch the games with the neighbors, and you knew that you would find familiar faces if you felt like a bit of company to share a cold brew. Cozy, unpretentious, and surrounded by large TVs, it has a pool table, shuffleboard, and a separate darts room. Tuesday is trivia night and on Wednesday it’s bingo. Every day something is on special. There are always 28 beers on tap, 20 craft beers, the green chili is outstanding, and the burgers are everyone’s favorites. Try their Citypub Burger with a ½ pound of ground sirloin, melted Swiss cheese, and bacon, drenched in the pub’s special sauce. Located in the former 1904 firehouse that housed the famous Micky Manor burger joint for 75 years, Federal Bar and Grill is a neighborhood pub in the Highlands/Jefferson Park neighborhood near the Sports Authority Field at Mile High. Although it looks like a dive on the outside, it is actually family-friendly, cozy, and laid-back, with a popcorn machine, a ping-pong table and Trivial Pursuit. There are also 20 lines of draft beer from all over the country and a nice outdoor area with park benches. The food is unexpectedly good: pub grub that has been elevated with skill and imagination into food easy to love, with items such as the pork belly bahn mi sandwich with marinated, seared, and caramelized pork belly topped with bahn mi slaw on a toasted hoagie bun loaded with sriracha mayo. Their burgers are fantastic and you can make your own with chicken breast, veggies, turkey, marinated portobello mushroom, lamb and/or beef, or you can choose one of their own concoctions such as The Med @ The Fed, with a lamb and beef patty with cucumber tzatziki sauce, tomatoes, and onions. Hanson’s Grill and Tavern is a funky family pub in the Wash Park neighborhood with two bars spread across two floors with large TVs, comfortable seating, a beautiful outdoor patio, and an upstairs lounge with two pool tables. 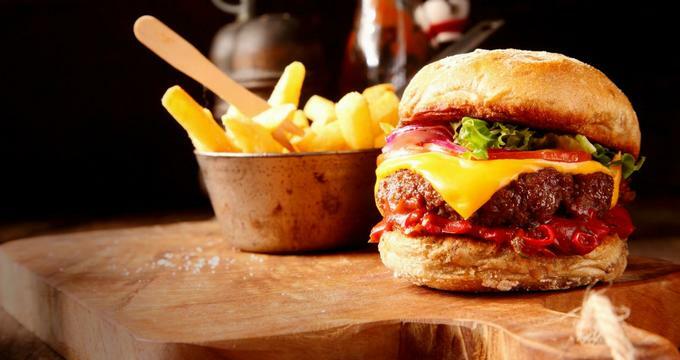 Hanson's is family owned and has an extensive menu of surprisingly good pub grub and a large selection of great burgers. 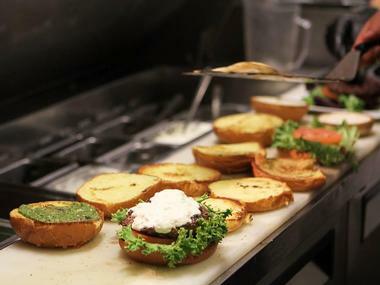 The burgers are made from local Gold Canyon beef, chicken, buffalo, or veggies. You can make your own from the large list of toppings or you can try one of their own, such as the Hawaiian with grilled pineapple, prosciutto, Swiss cheese, and teriyaki sauce. They also have a great selection of salads and sandwiches and the bar is fully stocked with beer and wine and makes some interesting cocktails. Their Sunday brunch is a neighborhood must. 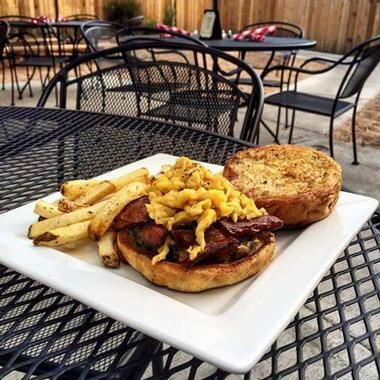 Located in the historic Ballpark neighborhood, Ignite is a trendy local bar and restaurant best known for its fantastic year-around rooftop patio, but also for a menu that surprises with dishes you have never tried before. 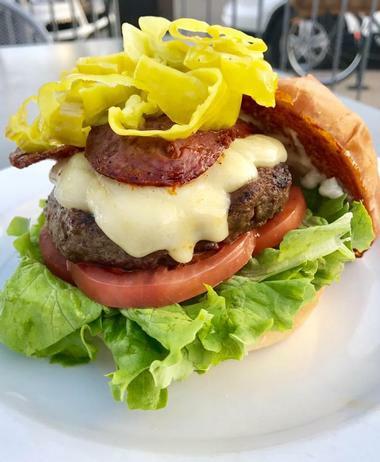 Ignite specializes in gourmet burgers, but it also serves wood-fired pizzas, a few interesting "big plates," and an addictive sweet-and-spicy bacon jerky named "man candy." The indoor dining room is bright and cozy with floor-to-ceiling windows and an open kitchen. Of the large selection of fully stacked burgers, the most famous, and the most popular, is their Hangover Cure with fresh ground beef, fried egg, hash browns, American cheese, bacon, tomato, lettuce, and pickle. The bar has a great selection of beers, wines, and bourbons and mixes some fun cocktails. Mile High Hamburger Mary’s is an LGBT-friendly sports bar chain with 15 locations all over the States. Their Denver location has its own personality, distinctly quirky, and is located in City Park West, with outrageous décor of purple wallpaper, all sorts of sports memorabilia, high heel shoes that serve as bill-holders, antique tennis rackets, and 21 enormous high definition TVs. The place is extremely popular and gets filled to the top, especially on game days or on nights with the live entertainment. The bar is fully stocked with an excellent selection of wines and beers on tap and the menu is, as expected, burger-centric. All seven burgers on the menu are made from Colorado beef and served with the signature knife stabbed in the middle. The portions are impressive. Their double burger comes with caramelized onions, a mix of sautéed mushrooms, two types of cheese, bacon, and Mary’s special sauce. Burgers can also be made with chicken breast or veggies. 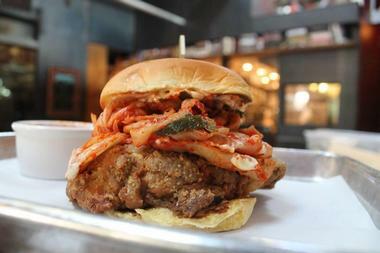 On the surface, Park Burger is a mini-franchise with an unassuming, diner-like décor. But behind it is world-famous Chef Jean-Philippe Failyau, and his take on the classic American burger is so spectacular that you will see lines of people waiting to enter any of the four spots around Denver. The burgers are huge, juicy, and topped with interesting, unusual ingredients, creating a meal that is way beyond what is basically American comfort food. 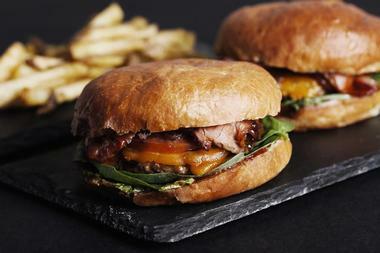 All burgers are made from certified Angus beef from the Harris Ranch, completely natural and never frozen. All burgers are served with tomato, lettuce, onion, pickles, and the house special sauce. There is a huge list of additional toppings for you to choose from. 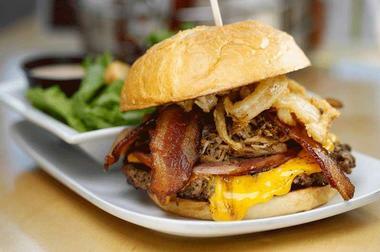 Try their signature Royale, with a 1/3-pound beef patty, blue cheese, caramelized onions, and bacon. 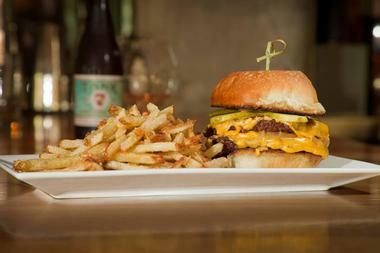 All Park Burger locations have excellent selections of local beers, wines, and sodas.